Byron himself displayed an extraordinary hostility to the dance. 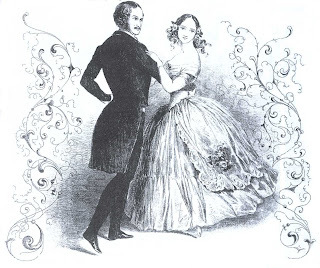 He objected to the "lewd grasp and lawless contact warm," especially between strangers; to the foreign origins of the dance and its adoption by the lower classes; and to the fact that "thin clad daughters" leaping around the floor would not "leave much mystery for the nupital night." 'National morals depend on national habits: and it is quite sufficient to cast one's eyes on the voluptuous intertwining of the limbs, and close compressure of the bodies, in their dance, to see that it is indeed far removed from the modest reserve which has hitherto been considered distinctive of English females. So long as this obscene display was confined to prostitutes and adultresses we did not think it deserving of notice; but now that it is attempted to be forced upon the respectable classes of society by the evil example of their superiors, we feel it a duty to warn every parent against exposing his daughter to so fatal a contagion'.